“Over the past several months, the BDA has travelled to key international events and established industry working groups to help plan the jurisdiction’s competitive strategy for the short- and long-term in both sectors,” the BDA said. “The groups, which weigh in on business-development strategies, bring together aviation and shipping government officials, law firms, ship owners, ship-management companies and other industry representatives. 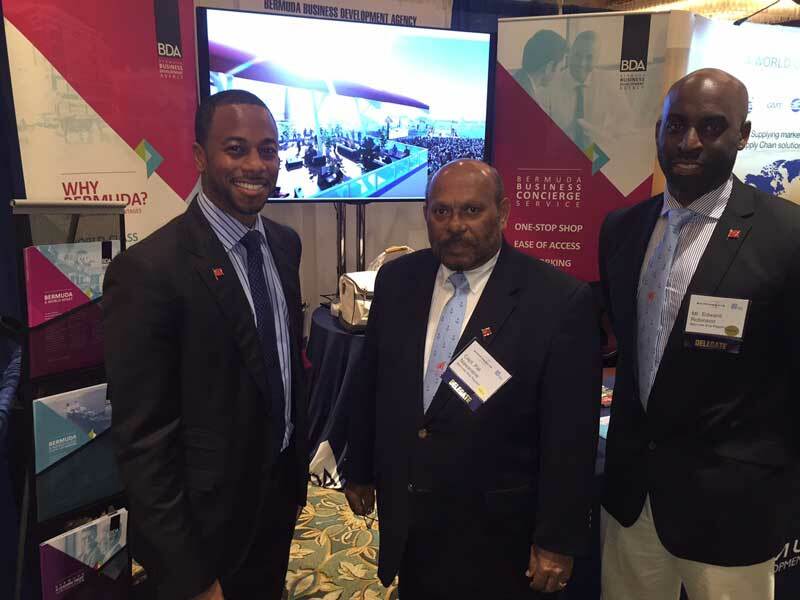 Richards has attended several key shipping and aviation events in Bermuda and overseas in recent months—and this week has been joined by industry and government representatives at the 31st annual Connecticut Maritime Association [CMA] conference in Stamford. The CMA attracts some 2,500 attendees, including ship owners and managers, ship manufacturers, lawyers and insurers, government agencies, brokers, charterers, ship registries, investors and financiers. The BDA has organised a substantial presence at the three-day conference that ends tomorrow, answering queries and connecting interested parties with Bermuda industry experts. “This is the largest North American conference devoted to the shipping industry,” says Richards, who was joined at the CMA by Bermuda-based Bernhard Schulte Shipmanagement, Charles Taylor & Co, Conyers Dill & Pearman, and Shoreline Managers. Also attending are members of the Department of Maritime Administration [DMA], which oversees Bermuda’s ship registry and is poised to transition into a semi-autonomous authority. “Our industry representatives have individually promoted Bermuda at previous conferences. As a result of the unity, cohesion and partnerships we have developed over the last six months, the BDA is now pleased to provide a central Bermuda presence for our jurisdiction’s stakeholders to leverage at this event,” Richards adds. He will also further raise Bermuda’s shipping profile this year by ensuring representation and business development at highly targeted international conventions such as: Posidonia 2016: Metropolitan Expo, in Athens, Greece June 6–10; 29th annual Marine Money Week, in New York City June 21–23; and 9th annual Superyacht Finance Forum in Monaco September 27. Richards will also be marketing to high-net-worth clientele at the upcoming Louis Vuitton America’s Cup World Series events in New York City in May and Chicago in June. In the aviation sphere, Richards is working closely with Bermuda law firms and the Department of Civil Aviation [DCA], which, like DMA, will transition into a semi-public administrative body in 2016. Richards attended January’s annual Global Airfinance Conference in Dublin with the DCA, plus law firms Appleby, Conyers, MJM and Walkers. A BDA team joined Cedar Aviation that same month at the National Business Aviation Association [NBAA] Schedulers and Dispatchers Conference in Tampa, Florida. In April, BDA CEO Ross Webber will travel with Richards and DCA officials to Tehran to explore investment and business opportunities at the Iranian Aviation Symposium. The highly-anticipated April 25–26 event marks a new era for Iran’s aviation sector, which opened for business this year after the lifting of nuclear sanctions. Organised by AeroPodium, the conference will attract aircraft operators, manufacturers, banks, leasing and finance companies, airports, law firms, and aircraft registries. The BDA said, “Bermuda’s aviation register, in existence since 1931, is used by multi‐national companies and high-net-worth individuals. Currently there are more than 700 aircraft on the Bermuda Register, of which some 130 are in the private category.